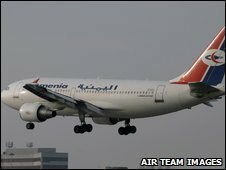 A Yemeni plane which crashed into the Indian Ocean was banned from France because of "irregularities", the French transport minister has said. Dominique Bussereau told parliament of ongoing concerns about the safety record of the Yemenia Airbus 310. The plane was heading from Yemen to the Comoros islands, but many on board began their journey in France. Rescuers have pulled a child from the ocean, the only known survivor from the 153 people on board. One of the rescuers told French radio that the 14-year-old girl had been seen swimming among dead bodies and debris in the choppy waters, more than two hours after the plane vanished from radar screens. She was pulled from the water suffering from exhaustion and cold, and is being treated at a hospital in the Comoros capital, Moroni. "We tried to throw a life buoy. She could not grab it. I had to jump in the water to get her," the rescuer said. Dr Ada Mansour, who treated the child in hospital, told AFP news agency she was conscious and talking, but added: "We are trying to warm her up because she was freezing." 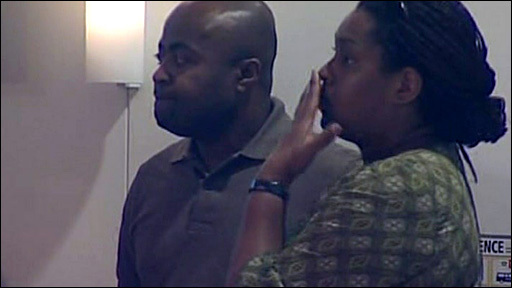 It is believed the girl lives in Marseille and was travelling with her mother to the Comoros. Most of the plane's passengers had flown on a different Yemenia aircraft from Paris or Marseille before boarding flight IY626 in Sanaa, the capital of Yemen. The crash was the second involving an Airbus aircraft in recent weeks. On 1 June an Air France Airbus 330 travelling from Rio de Janeiro to Paris plunged into the Atlantic, killing all 228 people on board. That tragedy also involved a large number of French citizens. In Paris, Mr Bussereau told legislators that the Yemenia plane was not permitted to fly into France, and raised concerns about the transfer of passengers from a plane classed as safe to one which crashed into the ocean. "A few years ago, we banned this plane from national territory because we believed it presented a certain number of irregularities in its technical equipment," Mr Bussereau told parliament. "The question we are asking... is whether you can collect people in a normal way on French territory and then put them in a plane that does not ensure their security. We do not want this to happen again." However, an airline spokesman said poor weather was more likely to have been a factor in the crash than the condition of the plane. Yemeni Transport Minister Khaled Ibrahim al-Wazeer also told Reuters news agency that the plane had recently undergone a thorough inspection overseen by Airbus and conformed to international standards. The crash prompted the European Union to propose a world blacklist of carriers deemed unsafe. The EU already has its own list, and its transport commissioner, Antonio Tajani, said such a list would be a "safety guarantee for all". Reports say the plane had been due in Moroni at about 0230 (2330GMT on Monday). Those on board included three babies and 11 crew. Some 66 of the passengers were French, although many are thought to have dual French-Comoran citizenship. All we can do is wait for information. Nobody is eating, nobody is drinking. All we are doing is waiting. Gen Bruno de Bourdoncle de Saint-Salvy, French naval commander in the Indian Ocean, said the plane had come down about 15km (eight nautical miles) north of the Comoran coast. The French military is helping in the search operation, which is being hampered by strong winds and high seas. Comoran journalist Abubacar Omar told the BBC that the government had appealed for calm, and key politicians had returned from overseas to take charge of the recovery operation. Another local journalist, Abdul Rahman Bar Amir, said: "Everybody is talking about only one thing - the crash. "There are groups of people huddled everywhere, talking. All we can do is wait for information. Nobody is eating, nobody is drinking. All we are doing is waiting." Have you been affected by the crash? Do you have any information about it you would like to share? Contact the BBC using the form below. Send your pictures to yourpics@bbc.co.uk, text them to +44 7725 100 100 or you can upload here. At no time should you endanger yourself or others, take any unnecessary risks or infringe any laws.